If you're looking for a science unit study homeschool program that is easy to use and is comprehensive and worth using, then you should check out Science Unit Studies for Homeschoolers and Teachers. I recently read through the book and really liked what I saw. The book says it is for ages 4-13. The first half of the book is for 4-7 year olds and the second half is for 8-13 year olds. The book is divided into 20 chapters or units. Each chapter is a unit. Within each unit there are 5-7 parts and within each part are 1-6 activities. At the beginning of each unit there is a material list telling you what you will need to complete all the activities. The materials are just simple items that can be found in most homes or local stores. The units for the older students have a test at the end of each unit with the answers to those tests at the back of the book. I liked the way the book was laid out and am excited to be able to use this unit study homeschool program with my son this year. He is 9 and loves science experiments. The heart of the book are the activities that are listed in each unit. They are written in a simple manner that any parent can understand. I love the fact that I can just pick up this book and start teaching, provided I have made sure that I have the materials I need. 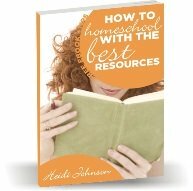 The book is written in a way that any homeschool parent can easily follow. The author also makes it easy to teach multiple ages at the same time. This book can easily fill a whole year science requirement. You might even find that your children actually remember what they learned. The more senses you use, the more you remember. If you're tired of complicated science curriculums and experiments that don't work, use this guide written by a homeschool mom who has used these science unit study homeschool experiments and tested them with many children and groups. If you want a free sample of a unit you can get both the Atoms and Molecules unit and Beginning Plants unit provided by the author. You will get a good idea of how the book is laid out and how easy it is to implement. The complete book can be purchased from Amazon for $16.95 which is reduced from $24.95 from the previous publisher. What a great deal this book is. A whole year of science instruction that your children will remember for just $16.95 is unbelievable! You might also want to check Amazon occasionally because they recently put Science Unit Studies for Homeschoolers and Teachers on sale for $12.20. You never know how long these sales will last though. If you want to read my interview with the author Susan Kilbride, just head over to Homeschool Science Experiments and find out everything you want to know about how the book was researched and written.